Two of the gentlemen lucky enough not to be “Checked at the Door” share a moment. A steady stream of vehicles pulled up to the Wetaskiwin Memorial Centre early in the evening of January 2. About 200 ladies adorned in elegant dress, fancy jewellery and huge smiles entered the decorated facility. But, coats, husbands and boyfriends were checked at the door. It was the 2nd annual Wetaskiwin Legion Ladies Auxiliary Dinner & Comedy Gala. They were soon to be treated to an excellent meal, entertainment by 3 comedians and ending the evening with dancing. The Auxiliary had a strategic partner help with the event; the Knights of Columbus. Through a reciprocal agreement, the Auxiliary provides assistance to the Knights of Columbus during their annual Maritime Night. 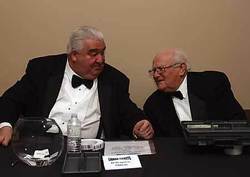 In return, the members of the Knights of Columbus attired in crisp white shirts, bow ties and tuxedos, sold beverage tickets, served beverages, supervised the silent auction and diamond ring displays and escorted the ladies to their tables. If you would like to apply for membership to the Wetaskiwin Legion Auxiliary, submit an application for membership, “in writing, in duplicate, upon the forms supplied for that purpose; and shall be signed by the applicant who must give in detail the particulars therein set forth. Every applicant must be proposed by two voting Members in good standing”.